Last edited by dolina; 08-02-2019 at 4:40am. My thoughts on this are two. 1) phone cameras are taking over for a lot of people. 2) Camera development has slowed. We are seeing new models, with the same sensor as the previous model (and other aspects of design), but with other minor tinkering improvements. People are not upgrading because they do not see the newer models as an upgrade. So my take isn’t much different to your Rick. People that don’t know how to use a camera to it’s full potential arnt buying. Cameras on phones have come a long way and the quality rivals some of the smaller cameras. On the other end, we are all looking for the next new design that will get us closer to the perfect shot. Not much has happened over the past few years apart from the mirror less ones and they cost a fortune. So not much happening in sales unfortunately. People have what they need now, and no amount of enticement from the manufacturers will change that! So as cameras, and camera sensor tech surged, so did the rate of it's growth. That is, last years camera is really no better than this years! But! ... 2006's camera wasn't half as good as 2007's camera. If they want to sell more .. then with market saturation being what it is ... the only way to achieve higher sales is via lower price points. Smartphone sales have peaked, and now in a slow decline too. It's paralleling what happened to the digital camera market with about a 6 year(or so) lag. But the phone market has many cheaper option manufacturers which are in effect holding up it's sales volumes. No such vendor exists in the camera market space. ie. there are no Huawei/OPPO/Xaomi type half decent quality manufacturer of cameras, so it makes sense that overall volume of the market is declining. I see this trend as a return to pre-digital sales balance. 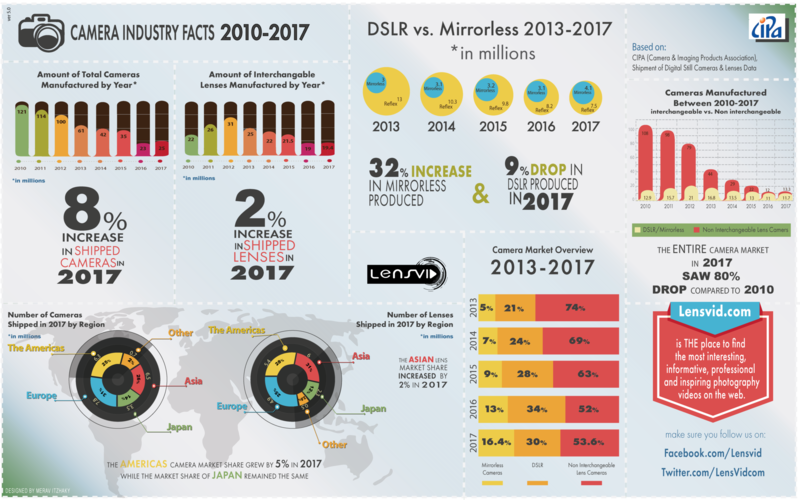 Smartphones have replaced Instamatic and basic fixed lens camera sales. ILC have always been a relatively expensive, niche market. That's it in a nutshell, Rick. All I ever see now are phone cameras and only the die heard DSLR/Mirrorless users generally with pro spec cameras. Less and less lower spec DSLR's and P&S's to the point I rarely see any! It was the P&S and lower spec DSLR's that were the big sellers years ago and that part of the market seems to have basically disappeared. 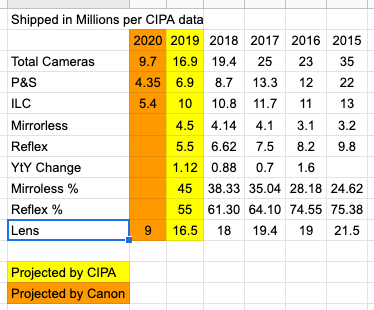 Also, as you say, there is less reason for people to "upgrade" as their current DSLR which they may have purchased back in the "heyday" of digital camera sales as for most people it is probably more camera then they will probably ever need any way. The thing is, *everyone* has a phone with them these days with their camera phone and thus many of us, even me, tend to leave their "proper camera" at home if it is not a specific camera shoot. It's just easier to take your phone and capture that moment when it occurs as you always have it with you. Camera phones are reasonably good in most situations for most people and it's always in your pocket.